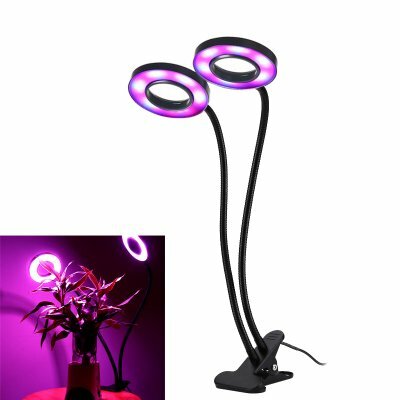 Successfully Added 18W LED Grow Light - Gooseneck Design, 36 LEDs, 400 To 840nm Wavelengths, Desk Clip, Double Switch to your Shopping Cart. 24 Red and 12 Blue LEDs to improve your plants growth and flowering. Double lamp gooseneck design lets you target the light exactly where it's needed most. Low power consumption LEDs wont cause excessive heat and will save you money. This 18 watt grow lamp has a 360 degree flexible gooseneck design and two lamps. This special design brings greater control for you to target the grow lights where they are needed most. You can focus the light on an individual plant or part of the plant to encourage growth in that area. Each lamp has 12 red LEDs and 6 blue LEDs that cover the 400 to 840nm wavelengths. These targeted light rays accelerate the growth of plants promoting foliage and flowering. An ideal way to help your indoor plants blossom earlier or increase their vegetative growth. Using LED lights means this grow lamp uses less energy that conventional grow lights, saving energy and working at a lower heat will save energy and money while also avoiding the need for cooling. A strong desk clip makes placing the light easy as it can clip directly to the plant pot or a table. With each lamp having an off medium and high setting there are a several lighting modes to choose from. A USB port on the lamp means it can run from your computer, laptop, power bank or USB outlet. Whatever indoor plants, flowers or fruit you're growing this is the ideal way to boost the output and growth with minimum cost. This LED grow light comes with 12 months warranty, brought to you by the leader in electronic devices as well as wholesale LED lamps and grow lights..